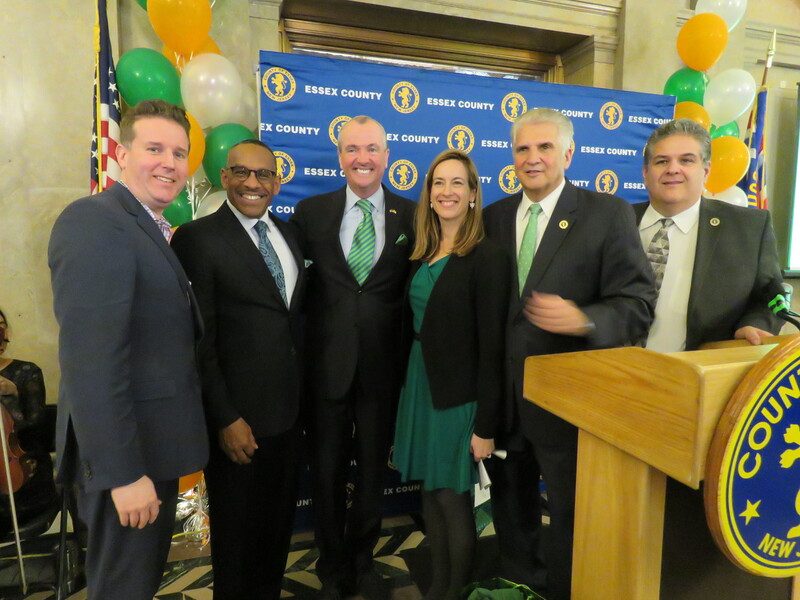 Newark, NJ – Essex County Executive Joseph N. DiVincenzo, Jr. hosted the 16th Annual Essex County Irish Heritage Celebration on Friday, March 22nd. During the afternoon ceremony, the County Executive recognized NJ Governor Phil Murphy as the 2019 Essex County Irishman of the Year and Congresswoman Mikie Sherrill as the 2019 Essex County Irishwoman of the Year. The Irish Heritage event recognizes the impact Irish men and women have had on the cultural, civic, political, law enforcement and economic history of the County. “I have always said that the strength of Essex County lies in the diversity of the people living and working within our borders. This diversity stems throughout every corner of the county and highlighting the contributions that each ethnicity has had on our economy, culture and history are part of what creates our sense of community,” DiVincenzo said. “Governor Murphy and Congresswoman Sherrill have helped shape the quality of life in our County and the State through their leadership and civic involvement. We are proud to recognize their accomplishments and the positive impact they have had,” he added. Gov. Phil Murphy became Governor of the State of New Jersey in 2018. He has advocated for growing the middle class and jumpstarting the state’s economy by targeting investments in people and infrastructure, reclaiming New Jersey’s mantle as a center of the STEM and innovation economies, protecting working families by raising the minimum wage and expanding earned sick leave for all. He has been involved in politics since the early 2000s. He served as NJ representative on the board of the NAACP, Finance Chair of the Democratic National Committee and has led national and state task forces on education and public employee pensions and benefits. In 2009, he was appointed the U.S. Ambassador to Germany by President Obama. In 2013, Murphy and his wife Tammy founded New Start New Jersey, an organization to rebuild the state’s economy from the middle class out. The organization partnered with the Heldrich Center for Workforce Development at Rutgers University to create the New Start Career Network, which is helping older, long-term unemployed residents once again actively compete for good jobs. Murphy received a bachelor’s degree from Harvard University and a graduate degree at the Wharton School at the University of Pennsylvania. “I am incredibly honored. My mother used to say you are known by the company you keep and today is a big deal for me,” Gov. Murphy said. “I am proud to be an Irish-American. The Irish community is a great community, but we are a rainbow of communities and our population in New Jersey is diverse. Today is an example of that,” he added. Congresswoman Mikie Sherrill represents New Jersey’s 11th Congressional District. She was elected into office in 2018. She graduated from the United States Naval Academy in 1994 and spent almost 10 years on active duty in the United States Navy. She flew missions throughout Europe and the Middle East as a Sea King helicopter pilot, worked on the Battle Watch Floor in the European Theater during the Iraq invasion and served as a Flag Aide to the Deputy Commander in Chief of the U.S. Atlantic Fleet. Congresswoman Sherrill also served as a Russian policy officer and worked on the implementation of nuclear treaty obligations and oversaw the relationship between the U.S. Navy and Russian Federation Navy. After leaving the Navy in 2003, she worked as a lawyer and eventually joined the U.S. Attorney’s Office in New Jersey as an Outreach and Re-entry Coordinator. As an Assistant U.S. Attorney, Congresswoman Sherrill worked to keep communities safe, prosecute federal cases and advise law enforcement on investigations. Congresswoman Sherrill holds a bachelor’s degree from the United States Naval Academy, a master’s degree in Global History from the London School of Economics and Political Science, and a Law Degree from Georgetown University. “What an honor it is to celebrate the contributions of the Irish community. I’ proud to be from Essex County,” Sherrill said. “It’s amazing to think of the stories of many ethnicities coming to America; to see how immigrants were able to thrive is a lesson to what our country has to offer. We are a nation of diversity,” she added. The entertainment was provided by bagpiper Barney Raftery, Paul Byrne and Amy Bashara. The invocation was presented by Father Ed Leahy, Headmaster at St. Benedict’s Prep and President of the Essex County Schools of Technology Board of Education.